– Will he or Won’t he? Two people reneged on their site visit and canceled with us at the last minute, both deciding that they preferred not to participate (for a variety of reasons). 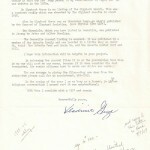 One person is an ex-publisher who has the backfile of his paper (1938 – 1945) “rotting in his attic and wishes to leave it so”. It’s a bitter pill to swallow. Finding these caches is difficult enough; locating them and being refused access is really hard to accept! Beck and I then drove to Carbondale where we planned to spend the rest of the day. First stop – Carbondale News Office. Arrived at 9:45 am and by 10:30 we were finished. While there, Robert Powell, Historical Society member and the person who was going to help us while there, showed up. Robert had brought along some of his own – which we inventoried and cataloged. 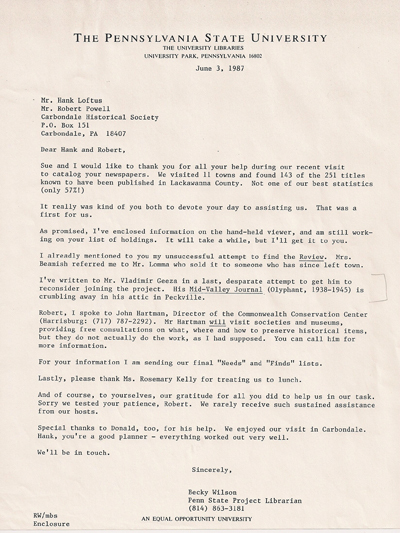 While working on Robert’s papers, Hank [Loftus], another Historical Society person, showed. 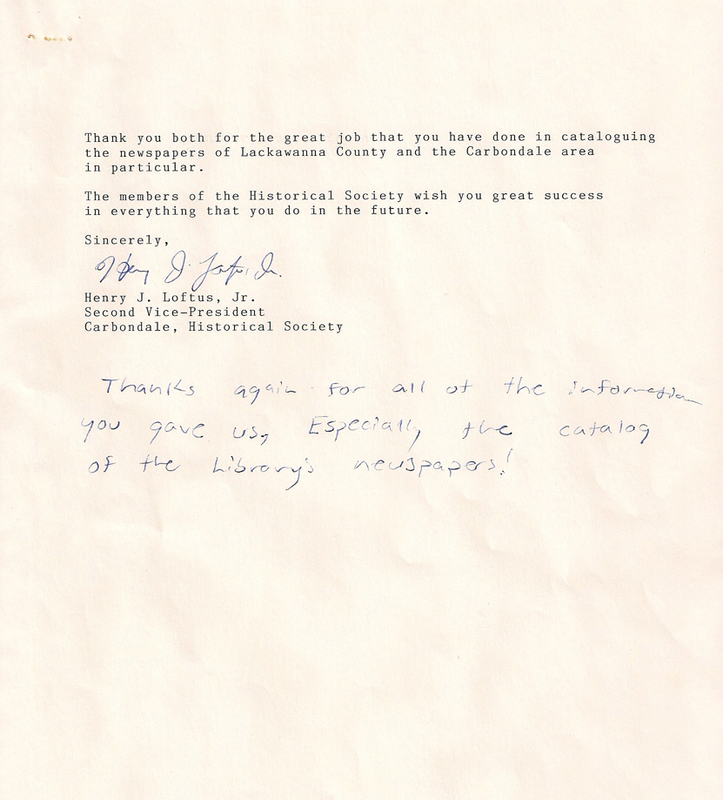 The four of us then walked over to the Carbondale Public Library where the Carbondale Historical Society’s bound newspaper collection was stored… by 5:45pm we came to our last volume. Headed back to our room at the Best Western. Back at the room, Beck called Mr. Vladimir Geeza in Peckville to confirm our visit for tomorrow. 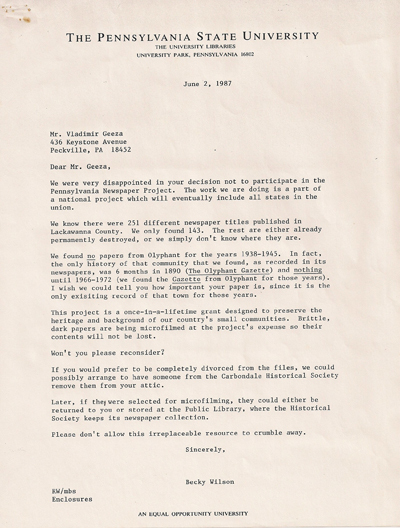 Mr. Geeza said he thought about it and decided not to participate in the Project. True he had the 6 or 7 years of the Mid-Valley Journal in his attic, but just the thought of his publishing days brought back bad feelings and emotions. Beck urged him to reconsider but he said that he just wanted it to die in his attic – that it wasn’t really worth saving. Mr. Geeza was very emotional about it, so Beck just let it go at that. Can a publisher make those kinds of decisions not to preserve a community’s news/history??? Certainly an interesting turn of events!!! Last work day in May! Where does the time go? 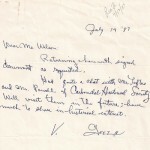 Letter to Mr. Vladimir Geeza from Becky Wilson asking him to reconsider his decision…. 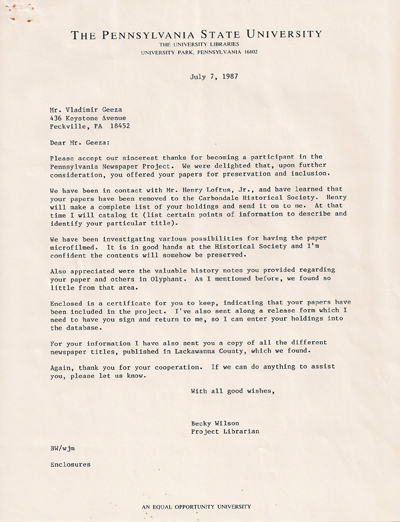 Letter to Becky Wilson from Vladimir Geeza, who has reconsidered… notice in particular his ultimate realization – many years later – that his newspaper, was, in the end, worthwhile! Spent most of the morning going through the stack of mail. 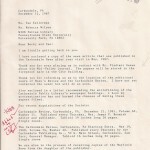 Received a letter from Mr. Geeza, publisher of the now defunct Mid-Valley Journal (Olyphant). He will now allow us to see his backfile! GREAT! Seems he want to get rid of it. What a nice surprise – Beck and I thought Mr. Geeza was going to stand firm and not let us see it. I called Vladimir Geeza. 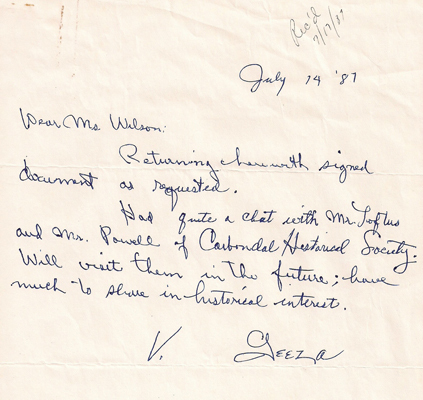 He is willing to give or lend his papers to the Carbondale Historical Society. Hank will call him to arrange a pick-up. Hank wants to film them right away. 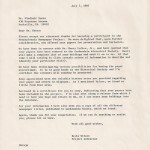 I then called Bill Hamill – Micor [Micrographics] can film the papers and have Hank pay for it. Hank would hand-deliver it. Bill will call me with a cost (we guesstimate $332.00 for 3 copies). Let Hank know what it will be. Micrographics International from Hazleton did Hank’s filming (badly!) and they may do this again. 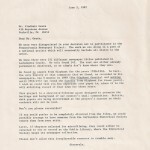 7/6/87 I called Bill Hamill. Bill said: $500.00 w/copies. Wow! 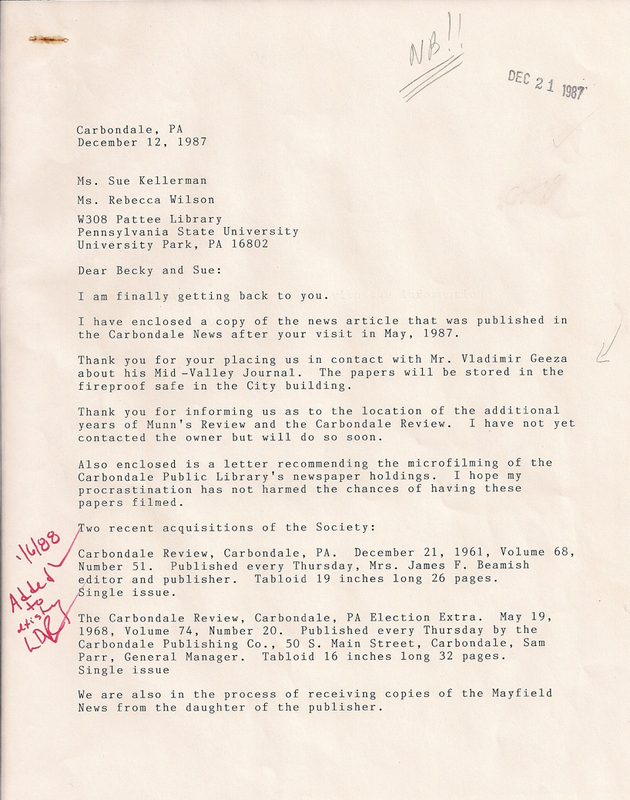 …Hank Loftus called – he gave us cataloging information on the Mid-Valley Journal. He and Robert Powell went to Mr. Geeza’s house and picked them up. Thanks Hank! 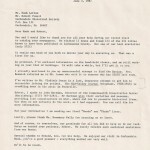 Letter from Hank Loftus, Second Vice-President, Carbondale Historical Society, to Sue and Becky December 12, 1987. 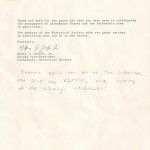 Reprinted with permission received from Mr. Loftus on October 12, 2012. 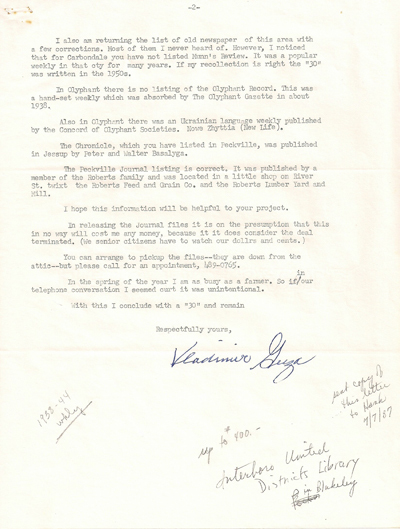 Mr. Vladimir Geeza’s paper backfile of the Mid-Valley Journal (Olyphant 1938 – 1944) housed at the Carbondale Historical Society was not microfilmed by the United States Newspaper Project (USNP). The original bound volumes are in archival storage in Room 303 of Carbondale City Hall, Carbondale, PA.